Worldwide, there is growing interest in market-based approaches to conservation. Public regulation and protected area systems, while critical, are insufficient to stop widespread resource degradation. For natural resources to be conserved they must be more valuable than the alternative uses of land and in order for them to be well-managed, good stewardship must be rewarded over bad stewardship. Markets and payments for ecosystem services, such as carbon sequestration, watershed protection, and biodiversity conservation are emerging as a viable alternative to protect and restore ecosystems while rewarding landowners for good land management practices. However, these approaches currently exist as pilots and certain barriers obstruct their development to an ecologically significant scale and among communities in developing countries. Lack of information - about buyers and sellers, about how these markets work, about how to design and monitor payment systems - is the most fundamental barrier obstructing market development around the world. This lack of information leads to high transaction costs, confusion on how to value ecosystem services, high uncertainties and risk, and general suspicion of market mechanisms. This project is designed to overcome this barrier of information in order to motivate market activity among policy makers, private companies, and NGOs. In addition, it seeks to democratize information and understanding on these markets among landowners and communities that have traditionally been excluded from the benefits of market mechanisms. In partnership with Forest Trends and others, this PROFOR activity supported the development of the Ecosystem Marketplace. The Ecosystem Marketplace is an internet-based clearinghouse and companion bulletin update initiated by the Katoomba Group. 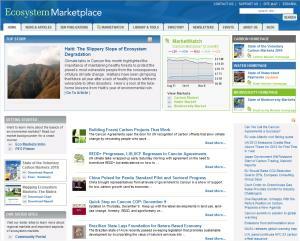 It serves as a 'one-stop-shop' of information on ecosystem service markets worldwide. Another element of this activity was the field-testing of tools and resource materials for PES project planning, design and implementation will to serve as resources for communities, NGOs, and policymakers. The tools provide practical guidance on establishing markets and payment schemes for ecosystem services and will be designed through guidance from community groups and others.